The T-800 Series pneumatic hand pump is a bicycle style pump designed to generate pressure and/or vacuum with ease. 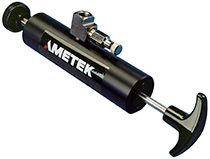 This economic solution is perfect for quick applications up to 200 psi, and a built in fine adjust makes controlling pressure simple. Four different models are available for vacuum or pressure, with either NPT or BSP connections.